For “Some of Us”, She She Pop entered the apparatus of the Württembergische State Theater. 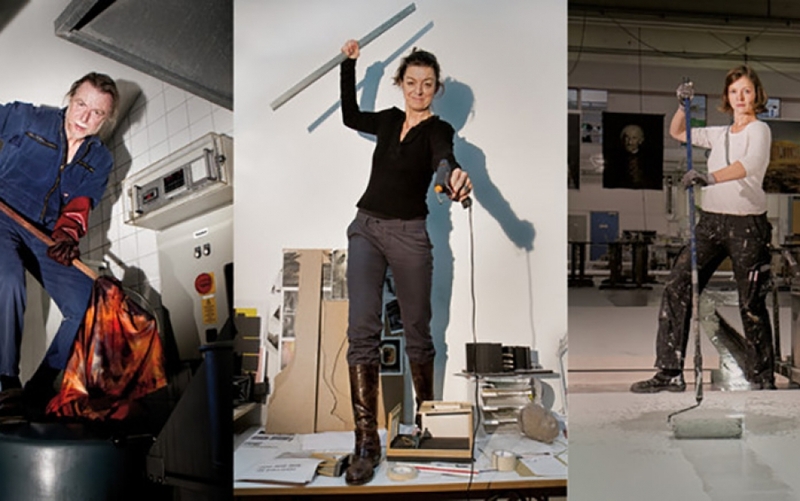 Highly specialized theater makers from Stuttgart (actors, technicians, designers, administrators, etc.) left their familiar work habitats to take to the stage for a performance of their own “Lehrstück”. 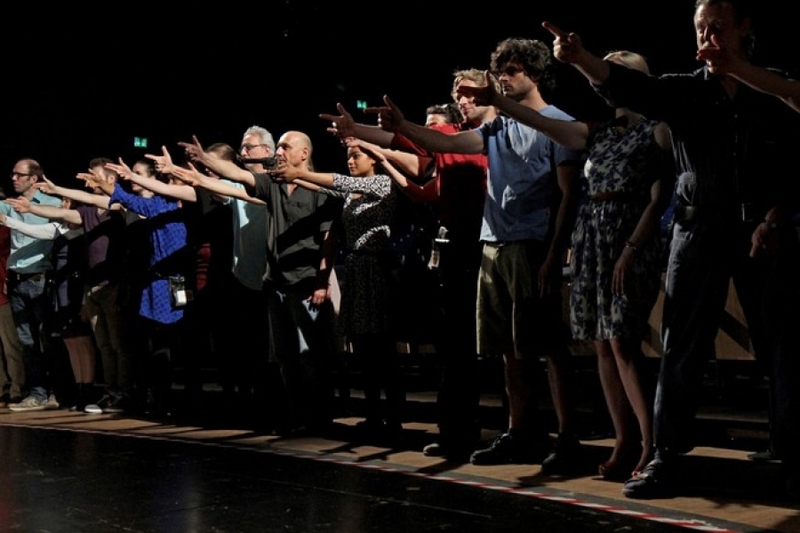 The scenic formats, questioning techniques, exceptions and rules are borrowed from Brecht and newly combined to form a utopian image: a working collective, who – artfully in disagreement – nevertheless comes to a kind of understanding. 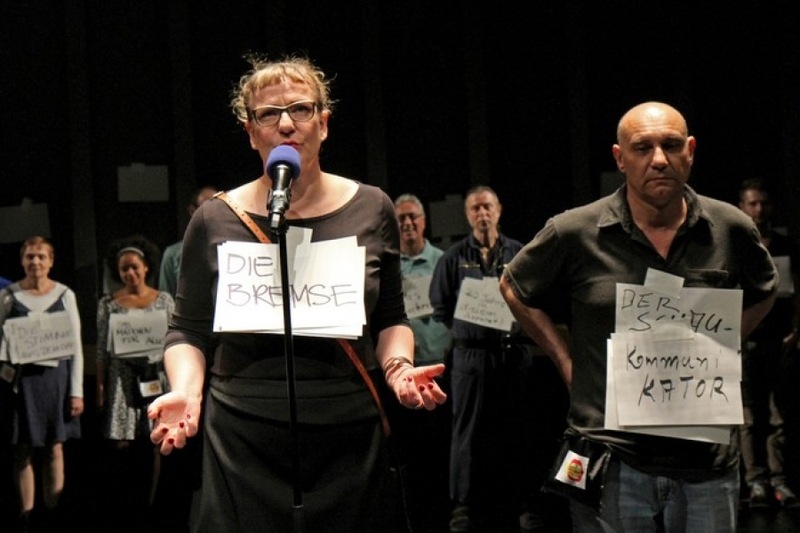 What kind of theater do we need in the future and how can we help to shape it? The fact that resorting to Brechtian approaches in this very funny, never boring 120-minute production doesn’t feel outdated at all is one of the many surprises of this evening. Asking questions, very simple questions, repeating these questions, demanding explanations and changes and thus blurring the boundaries between illusion and reality – this comes across very fresh on stage, never half-baked or overly theoretical. 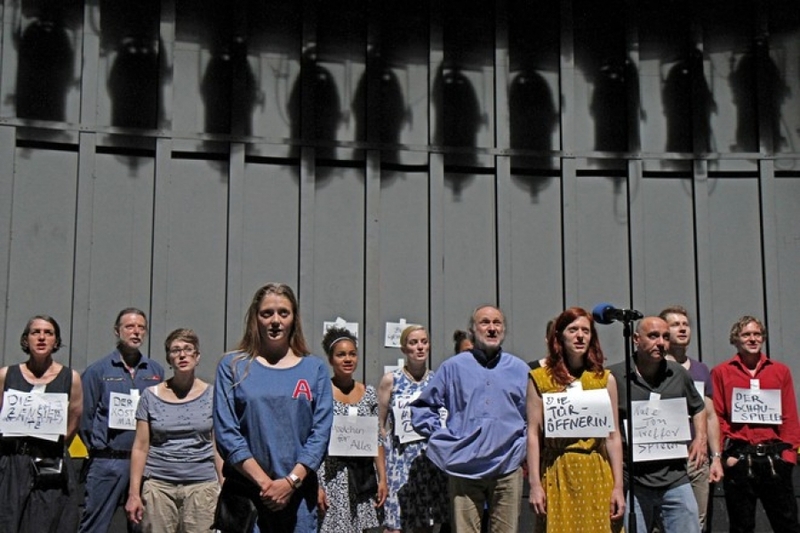 The actors as well as the alleged invisible workers come across very well on stage. 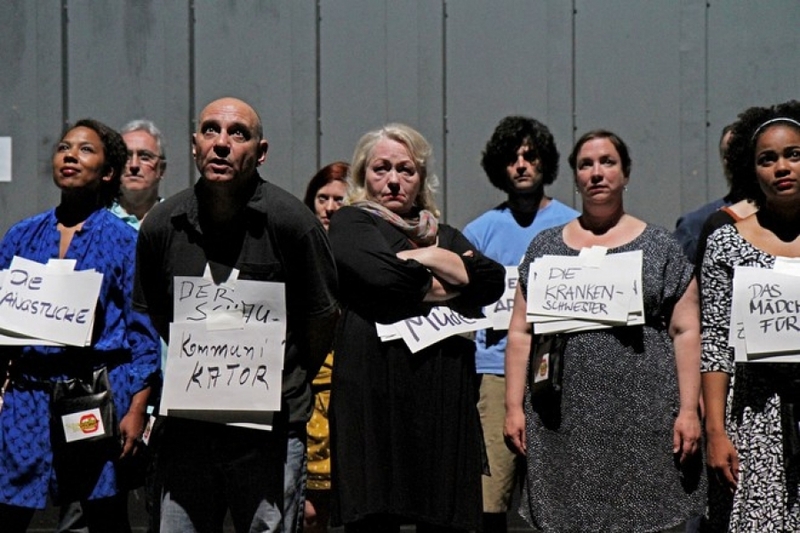 The collective consisting of independent theater makers, the ensemble and the theater’s employees did all of the work in creating this evening examining the working conditions of theater. 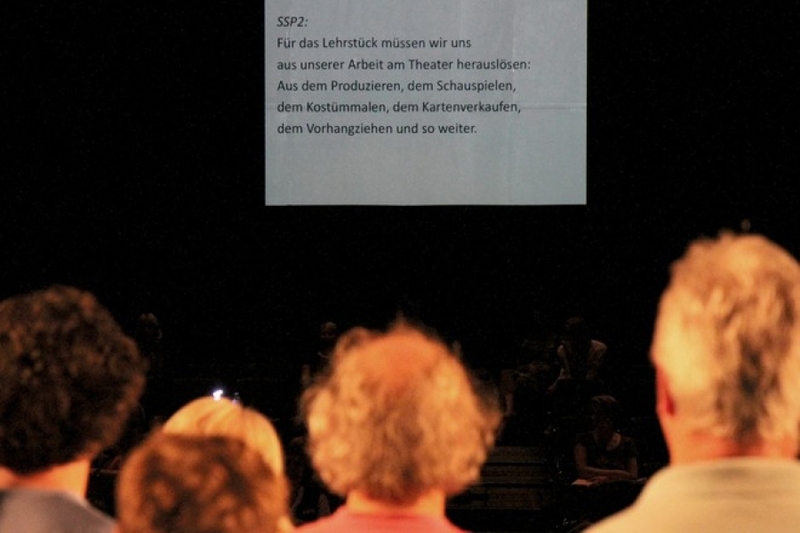 They visited Schauspiel Stuttgart over and over for more than a year in order to artistically survey this behemoth: meetings, interviews, workshops as well as negotiations determining who would be paid what if they are not one of the actors who appear on stage. The performance group documented the process in a collection of loose sheets of paper that they provided to the audience as a program. (…) Documents reflect the various stages of the development process: from the funding application to Germany’s Federal Cultural Foundation to concept statements to emails with the participants. 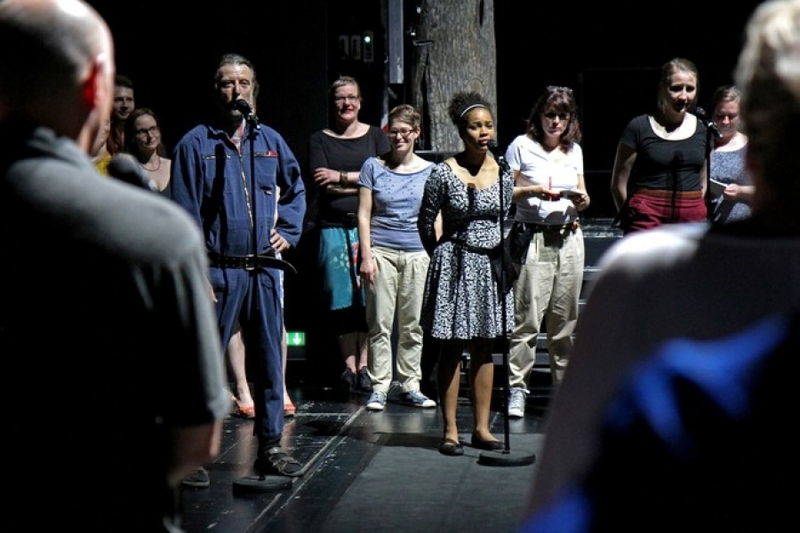 The audience learns that one or another participant actually wanted to leave the project and that the attempt to bring theater employees from the workshops on stage lead to large organizational entanglements – because life backstage also means a life with a working time account, overtime and deficit hours. The fact that technicians and artisans also end up standing on stage at the end of the day speaks of the success of She She Pop’s persuasive efforts but is most of all a boon for the production.